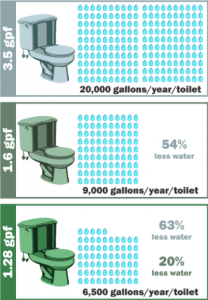 All Santa Barbara Green Businesses must replace or retrofit toilets flushing at higher than 1.6 gallons with high efficiency toilets (1.28 gallons or less per flush). ULFTs and HETs are approved for use. 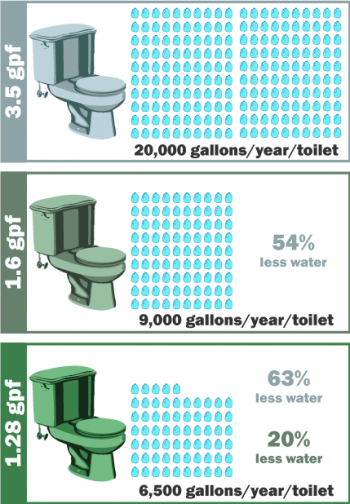 Your water utility may have a rebate program for high efficiency toilets. ULFTs: In 1994 new water conserving toilets, called ultra-low-flush toilets (ULFTs) were required in all new construction. ULFTs use 1.6 gallons per flush and are much more water-efficient than older toilets, which use up to 7 gallons per flush. Each installed ULFT can save a typical family 70 gallons a day in water use. A number of commercial ULFTs are available in a range of designs that have 1.6 gallons per flush. The efficiency of a flushometer and bowl combination toilet depends mainly upon the regular maintenance of the flushometer valve. HETs: High-Efficiency toilets (HET) are now the standard and flush at least 20% below the US maximum of 1.6 gpf, equating to 1.28 gpf or less. Many HET’s are dual-flush toilets, which have two separate flush volume options, a half flush (.8 gallons) and a full flush (1.6 gallons). There are several industrial flushometer HET’s on the market, and over a dozen have passed performance standards set by the CUWCC (California Urban Water Conservation Council). Dual-flush handle retrofit for flushvalves: This water saving mechanism retrofits to most existing valves and reduces water volume by up to 30% when activated for half-flush.